Showcase your appreciation for aquatic wildlife with the Beckett Turtle Pond Spitter Package. 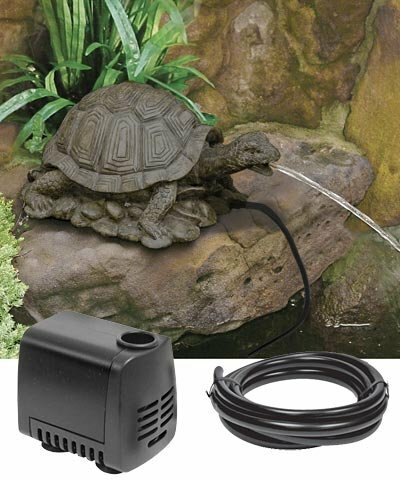 This wonderful kit provides an adorable turtle spitter, as well as a pump and tubing to create a functional water accent. The resin turtle figure stands atop a pile of faux rocks, and each foot spreads outward for a fun, wide stance. Its extended head and neck offer an inquisitive hint, and the olive and gray colors enhance the natural motif. The included Beckett Statuary Pond Pump moves just the right amount of water to the spitter, and rests submerged in your basin for quick installation. Attach the included Beckett Fountain and Spitter Black Vinyl Tubing to the pump outlet, and connect the other end to the barbed fitting on the spitter. This allows water to exit from the mouth of the turtle, bringing a soothing sound and fantastic aeration to your small feature. The turtle's resin body offers an exciting accent for many seasons, while the black, vinyl tubing remains flexible and inconspicuous in your feature. Enhance your container garden with moving water and fun wildlife using this Turtle Pond Spitter Package. Qty 1 Beckett Fountain and Spitter Black Vinyl Tubing, 1/2", 20 ft.